Biographies of great men are always a blessing and a help in placing things right in history. C.I. Scofield is a household name among Christians because of the Reference Bible bearing his name. Trumbull was a personal friend and student of Scofield’s and writes in a more positive tone than some other later writers who may have been writing for different reasons. Trumbull’s biography was first printed in 1920 by Oxford University Press, which also first published the Scofield Reference Bible. 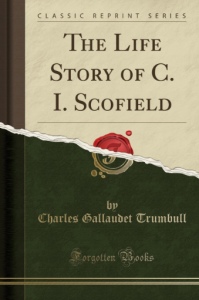 The book is an easy read taking the reader through Scofield’s unsaved years as a confederate soldier to Kansas lawyer to U.S. Attorney for the district of Kansas. His salvation testimony is moving, having been led to the Lord by one Thomas S. McPheeters, a personal friend. Scofield immediately put away the drinking from his lawyer days and was led toward Christian ministry both in pastoring and writing. He eventually became pastor of First Congregational Church in Dallas, a denomination he later left. He was called to D.L. Moody’s church in Northfield, Mass. by Moody himself and there became involved in Northfield and Niagara conferences. There he also met and was tutored by James. H. Brookes who had considerable influence on his doctrine and ministry. Trumbull published this work (1920) before Scofield’s death in 1921.